At the end of each semester, the College of Engineering honors twelve outstanding seniors. Of these twelve, one is selected to serve as the college’s student marshal at the undergraduate commencement ceremony. Zachary Carpenter has been selected as the 2018 spring commencement student marshal representing the College of Engineering at the University Graduation Ceremony on Saturday, May 5. Carpenter has been on the Dean’s List every semester at Iowa State, obtaining a 4.0 GPA in mechanical engineering courses and being named a Cardinal Key Honor Society member. Outside his success in the classroom, Carpenter has served as a peer mentor for the Mech E Learning Community, a teaching assistant for ME 370 and ENV S 342, as an Air Force ROTC cadet and has volunteered with children at various Ames organizations, such as St. Jude Up till dawn Fundraiser, Relay for Life and Ames Community and Youth Club. Carpenter participated in the National Reconnaissance Office summer research program in Washington D.C. and has received over eight honors and awards during his time at Iowa State. 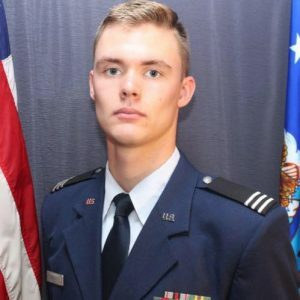 Serving in four different leadership positions in the Air Force ROTC and as the leadership development chair for TKE, Carpenter has led many students at Iowa State. 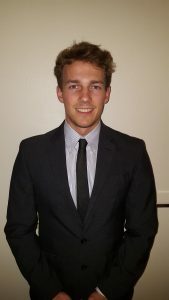 “Zach has acted with independence, reliability and excellent communication skills in this role. Feedback from the students in his learning community section was overwhelmingly positive with students highlighting his leadership skills, his ability to present information and his down to earth personality, which made students feel comfortable,” Van Winkle said. In addition, Carpenter had two internships with Medtronic, as a manufacturing intern, and in the National Reconnaissance Office in Virginia. Carpenter will be a U.S. Air Force Officer upon graduation. Ryan Gallus, computer engineering and business administration. Gallus completed his honors project entitled “Predicting What’s Popular: Social Media Analytics with Machine Learning” and travelled to the United Kingdom in Fall 2015, studying abroad at the University of Birmingham. On top of a cumulative GPA of 3.86, Gallus has been a part of the President’s Leadership class, raised over $1,250 dollars for the Dance Marathon, served on the recruitment committee and as a student admissions representative and membership development coordinator. In addition to these efforts, Gallus co-founded the Delta Sigma Phi Fraternity and served as the first vice president of risk management and judicial affairs. Also elected as philanthropy chair, Gallus organized the 4K Hay Run for Cancer with over 150 participants, raising over $1,500 dollars for the Ulman Cancer Fund for Young Adults. Gallus has also served as a community advisor for his residence hall and a freshman honors program leader. “On top of all of Ryan’s accomplishments, he is willing to go the ‘extra mile’ for his peers and does it with a smile on his face and a concern for all,” said Vicky Thorland-Oster, manager of student services in electrical and computer engineering. Alphonse’s strong academic commitment and extracurricular pursuits were born of curiosity and interest in electronics, said Anthony Moore, academic adviser in electrical and computer engineering. “George must love what he is doing, because he always has a smile on his face as I pass him in Coover Hall,” said Moore. Alphonse’s family immigrated from Sudan to Des Moines, Iowa, which gave him the opportunity to pursue his dreams, in the face of adversity. He has a 4.0 GPA. “George could easily have been accepted into most elite electrical engineering programs in the US,” Moore said. Alphonse’s focus in electrical engineering at Iowa State is on very large-scale integration and microelectronics. 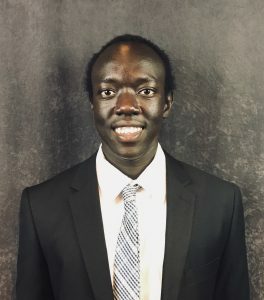 Outside the classroom, Alphonse has been involved as an undergraduate teaching assistant, PrISUm Solar Car Team, IEEE Engineering Student Council, IEEE Beta Kappa Nu Honor Society, Tau Beta Pi Engineering Honor Society, National Society of Black Engineers and ISU Hackathon. Additionally, Alphonse interned with Magnetics Research Group, Texas Instruments and John Deere. Mengyu Wang, aerospace engineering with secondary majors in economics and math. 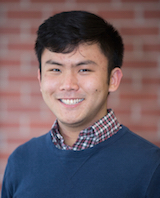 Wang is part of the honors program and has a cumulative GPA of 3.97. 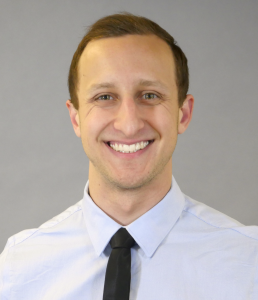 He has served as a research assistant in the microscale and interfacial fluid physics lab under Thomas Ward III, as a software engineering intern for Rockwell Collins, as a research assistant in the multidisciplinary optimization design engineering lab and as an astrophysics intern at NASA in the gravitational astrophysics lab. Wang has also been involved in the Aerospace Mentorship Program, ISU Student Government and Make to Innovate. Wang’s honors and awards include the Iowa Space Grant Consortium Scholar and Research Grant, ISU Honors Program, National Merit Scholar and Goldwater Scholar. In addition, Wang has served as a crisis counselor, an aerospace mentor program mentor and program chair, adult English tutor at the Catherine McAuley Center and as a volunteer with the U.S. Army Corps of Engineers. Kaesey Glaess, agricultural engineering with an emphasis in animal production systems and a minor in animal science. Glaess served as research assistant for the department of agriculture and biosystems engineering and was a participant in the Uganda program for the center for sustainable rural livelihoods during her time at Iowa State, all while achieving a cumulative 3.95 GPA. “Kaesey has an inquisitive nature that keeps her learning and an infectious energy that helps the students around her see the excitement of a topic,” said Daniel Anderson assistant professor of agricultural and biosystems engineering. Glaess studied abroad for two weeks in May 2017, visiting Wageningen University in the Netherlands for an Animal and Dairy Science program. She also interned for Energy Panel Structures Buildings in Graettinger, Iowa during the summer of 2017. In addition to her academic involvement, Glaess served on the sisterhood committee for Alpha Delta Pi and on the Student Alumni Leadership Council CySquad. “Kaesey Glaess is a very humble student who has quietly proceeded to the top tier of her class. She is highly respected by her peers, is a pleasure to have in class and overall is a great person that other gravitate to,” said Steven Hoff, professor of agricultural and biosystems engineering. Glaess also held leadership positions in the American Society of Agricultural and Biological Engineers, Iowa State Block and Bridle, Iowa State Engineering Ambassador and Mentor Program, Department of Agricultural and Biosystems Engineering, Tau Beta Pi Honor Society and Alpha Epsilon Honor Society. Kevin Prince, civil engineering with an emphasis on environmental engineering. Prince first discovered his passion for environmental engineering on a trip to Manila, Philippines. Prince switched from studying materials engineering to civil engineering when he returned home, in hopes to improve international development and drinking water. Prince also went on a study abroad trip to Singapore in 2015 and led two travel team trips to Ullo, Ghana in December 2016 and 2017, through Engineering Without Borders. EWB travelled to Ullo to install wells, supplying water to the community and to the school. Throughout the EWB planning process, Prince led weekly meetings of 40 to 60 individuals, managed the project, delegated tasks and prepared presentations. He also communicated with the national EWB organization throughout the process. While in Ullo, Prince and the four team members who he managed assessed feasibility and initiated the project. In addition to his work with EWB, Prince participated in Dance Marathon, the RainWorks Challenge and made the Dean’s List every semester, all while earning a 3.89 GPA. Prince has completed three internships with Becton, Dickinson and Company, the U.S. Army Corps of Engineers-Omaha District and Black and Veatch. Prince also researched under Kaoru Ikuma, assistant professor of civil, construction and environmental engineering, and with Matthew Panthani, assistant professor of chemical and biological engineering. After graduation, Prince will do a summer internship at the National Renewable Energy Laboratory in Golden, Colorado. In August, Prince will be begin a doctoral program at Colorado School of Mines. Natalie Hanson, biological systems engineering with an emphasis on food engineering and a minor in meats. “Hanson is an excellent student who has performed at the highest level in my courses. 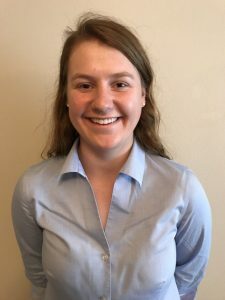 Natalie is very conscientious and seeks to understand the underlying principles of the vast array of topics we have covered,” said Steven Hoff, professor of agricultural and Biosystems engineering. 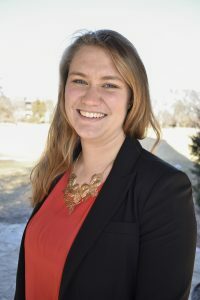 She interned in Shanhua, Taiwan for the Borlaug-Ruan International Internship Program at the World Vegetable Center in 2014, as an engineering intern at Land O’Lakes, Inc. and as a production management engineering at Cargill, Inc.
At Iowa State, Hanson has served as a teaching assistant, a peer mentor and a departmental tutor for ABE, and has led such organizations as Student Admissions Representatives, Engineers’ Week, CyServe Council, President’s Leadership Class, First Year Honors Program, VEISHEA, Inc., Freshman Council and Freshmen Leaders in Engineering. Hanson’s involvement at Iowa State doesn’t end there. She was involved in the American Society of ABE, Memorial Lutheran Church, Tau Beta Pi, Cardinal Key Honor Society, the Navigators, Champion Reciprocal Meat Conference Meat Science Quiz Bowl Team, ISU Intercollegiate Meats Judging Team, Animal Science Academic Quadrathlon Team, Agriculture Future of America, Alpha Gamma Delta Women’s Fraternity and Anders Residence Hall House. Not only was Hanson involved in all these organizations, but she has received 15 (and counting) honors and awards throughout her education at Iowa State. Aaron Roszak, materials engineering with an emphasis in polymers. Roszak has achieved a cumulative GPA of 3.94 and completed two internships with Medtronic and 3M. 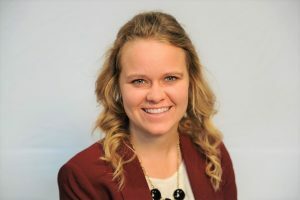 Roszak’s leadership experience includes positions on the ISU Material Advantage Student Organization Executive Board, MSE Undergraduate Student Advisory Council and as a MAT E 215 teaching assistant for five semesters. 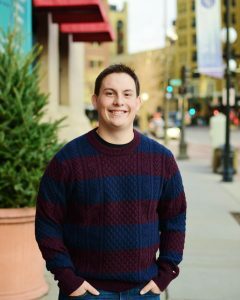 “While Aaron’s stellar academic performance, industry experience, service to the department and good citizenship in the Ames community are exemplary, it is really his amazing character and tireless commitment to personal and professional excellence that sets him apart from his peers,” said Andrea Klocke, academic advisor in materials science and engineering. Upon graduation, Roszak will begin an engineering position with Honeywell in Minnesota. “I am confident that Aaron will continue to make our MSE Department and the Iowa State community extremely proud with the many accomplishments that are certain to come in his career,” Klocke said. 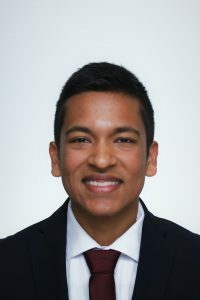 Mitra started coursework at Iowa State during the summer before his sophomore year of high school and continued to add more courses each semester until he graduated from high school in 2015. Mitra also began doing laboratory research before becoming a full-time student at Iowa State. “I have yet to see another student with this much coursework coming into the ChE program at ISU,” said Adam Dane, chemical and biological engineering academic advisor. With a 3.97 GPA, Mitra has made the Dean’s List every semester and, according Balaji Narasimham, titled, is at the top of the list of all undergrads who have researched in his lab over 17 years. This is no small feat considering that Narasimhan has mentored more than 90 undergraduates in that time, some of whom have gone on to earn NSF Graduate Fellowships. Mitra will graduate with two peer-reviewed publications, an EMT-B certification, experience in undergraduate teaching assistance, tutoring, volunteering as a paramedic, at a nursing home and at Mercy Hospital in Des Moines. As a Chemical Engineering Ambassador, Mitra has given tours of Sweeny to many prospective students and families, as well as training other ambassadors. “Akash has the academic background, research experience, and extracurricular involvement that makes him stand out amongst his other high achieving peers in the College of Engineering,” said Dane. Mitra will attend Northwestern University Medical School starting in fall 2018. Madison (MJ) Kamin, construction engineering with an emphasis in building. 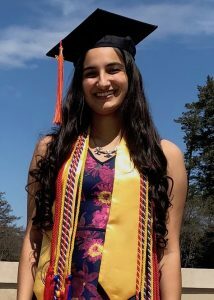 Kamin has achieved a cumulative GPA of 3.95 and received such awards as the Marion and Andrew Pontius Scholarship, Woodruff Scholarship and Dean’s List recognition every year. Kamin has been heavily involved in golf at Iowa State, with a position on the All-Big 12 Academic Team during her junior year and on the All-Cyclone Team three times, awarded to the athlete with the highest GPA on the team. According to Chris Rehmann, associate professor of civil, construction and environmental engineering, Kamin’s proudest moment was begin named Big 12 Scholar Athlete of the Year during her junior year. She was nominated for the Athlete of the Year award by her coach and voted for by other Big 12 coaches. In addition to the golf team, Kamin has been involved with the Associated General Contractors and Student Athlete Advisory Council. Through SAAC, Kamin helped with CyCans Food Drive, collecting 21,900 meals to the hungry, and Soles4Souls, providing 1318 pairs of shoes to those in need. As part of Soles4Souls, Kamin travelled to Haiti for a service trip, along with eight other student athletes, where she distributed hundreds of pairs of shoes to children. Kamin spent two summers interning for The Weitz Company in Des Moines on a project at Drake University. She will work for JE Dunn Construction after graduation. Ashley Swift, industrial and manufacturing systems engineering with an emphasis on operations research. With a 3.93 GPA, Swift made the Dean’s List every semester at Iowa State, travelled to Singapore in the Spring of 2016 for a study abroad trip, was awarded with the Iowa Alpha Scholarship for the Tau Beta Pi Engineering Honor Society and received multiple academic-based scholarships. “Ashley’s academic performance has been exceptional, and was so strong that she was asked to conduct analyses and research on best practices of online teaching methodologies,” said Michael Helwig, lecturer in industrial and manufacturing systems engineering. Swift was also hand-picked to be a teaching assistnat in Valencia, Spain for an engineering economics course, based on her mastery of the material, according to Helwig. Swift is a mellophone section leader for the ISU Marching Band, a member of multiple honor societies, the Talking about Programs Abroad Team and the Society of Women Engineers. 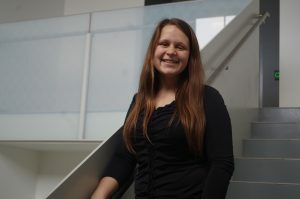 “Ashley is personable, utterly dependable and a model of an outstanding student,” Helwig said. Chockalingam achieved a 3.52 GPA and has been a member and leader in IEEE Eta Kappa Nu Honor Society, Cardinal Key Senior Honorary, HackISU and Society of Women Engineers. For HackISU, Chockalingam served as the Outreach and Marketing Chair, engaging local software engineers through Amazon Alexa workshops and web development, as well as social media coverage. In SWE, Chockalingam served as Director of SWE University Camp for two years, reaching out to high school women interested in engineering, as well as website and publicity chair for the past year. Chockalingam has completed internships with Leading Edge Hydraulics, UTC Aerospace Systems and The Boeing Company. Upon graduation, Chockalingam will be working with the Production Analytics Group supporting Boeing commercial airplanes for The Boeing Company.